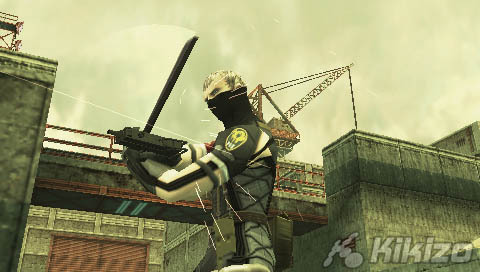 Does Kojima Productions shine on PSP too? 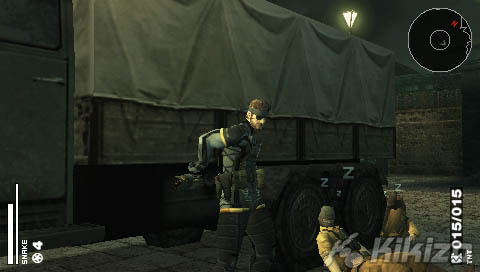 Through the use of non-lethal force, Snake (and other squad members once recruited) can incapacitate his enemies and drag them back to the truck in a caveman-mating type fashion. After a few days of interrogation and presumably a little bit of brainwashing, they eventually come round to your way of thinking and are then selectable for missions. Each soldier will have their own strengths and weaknesses and putting them in the right squad is all important. 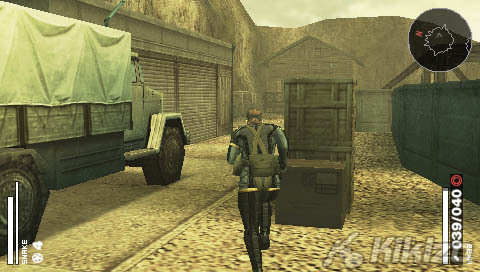 There are four sneaking units (alpha, bravo, charlie and delta) which are the units sent on missions into the field, spy units which can be placed at any unlocked locations and return various reports and extra information (which is then displayed on the map), technical units which design new weapons and items, and medical units which help make allies' wounds heal quicker. "If the prisoner is not dropped within pixel perfect precision, radio Roy will refuse to sanction his return to the truck, and an unintentional game begins." 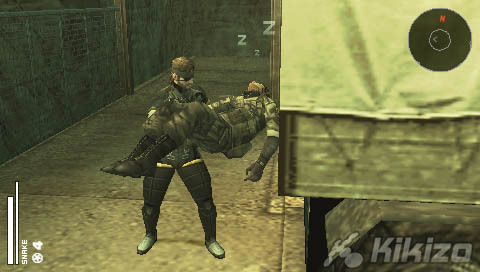 Whichever sneaking unit Snake's in is the unit sent on the field missions, which can be frustrating when all you want to do is leave him behind to recoup his health. Still, it is easy enough to swap characters simply by finding one of the several pre-determined points where you can hide in your government-issued cardboard box and then switch to your required comrade. This also helps when recruiting enemy soldiers - as dragging them is a slow and cumbersome process, they can be dropped by an hidden ally. A quick call on the radio to Roy will then instruct your ally to return him to the truck for - ahem - re-education. Although, if the prisoner is not dropped within pixel perfect precision of some of the boxes housing hidden comrades, radio Roy will refuse to sanction his return to the truck. So an unintentional game begins of picking up the prisoner, moving a few steps one way, dropping him and calling Roy on the radio again. "Zero stamina is effectively death, so keeping this up is as much a priority as keeping your health." A novel interpretation of the standard radar is provided by the sound indicator. 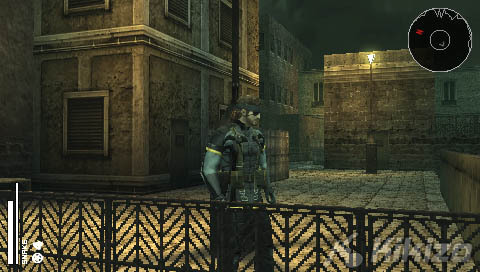 This displays the sound waves surrounding the player with far away sounds appearing blue and nearby sounds appearing red. 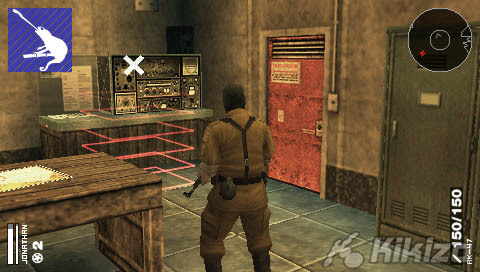 Any noise the player makes also shows up on the indicator and making too much attracts the attention of nearby guards. What's not so novel is the stamina and health bars. The latter is an accepted videogame convention whilst the former is a right royal pain in the nether regions. Health is lost when attacked or shot and can be replenished easily enough via health pack injections or by leaving your soldiers out of missions. Stamina is lost through every action you perform - some actions deplete your stamina quicker than others. It can be refilled by taking rations although - like it says on the tin - these are few and far between and there are never quite enough to keep you in tip top condition. Zero stamina is effectively death, so keeping this up is as much a priority as keeping your health. 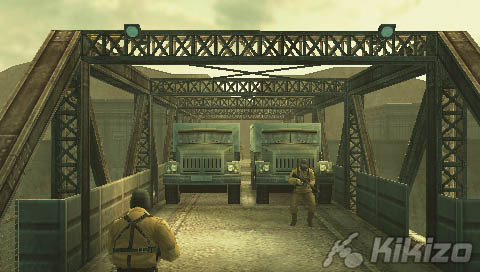 A plethora of equipment rounds out the rest of the single-player campaign - everything from a standard and obviously silent knife, to AK-47s, grenades, TNT, mines and even a wind-up waddling duck that will distract enemy soldiers. Multi-player games are also catered for with deathmatch and capture the flag modes and - in a neat touch - soldiers can also be recruited in the single-player campaign player based on the wireless access points which are nearby. Big and comprehensive, Portable Ops is also complex - overly so at times. 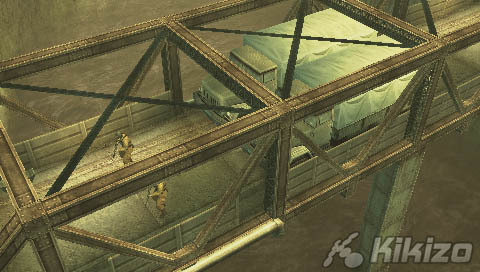 Perhaps this is due in part to a lack of polish, which is evident in the game's invisible barriers or animations that finish abruptly when you complete a mission. Some more time in development could have turned this into a must-have title. As it is, it's a nice-to-have. THE VERDICT: Everyone's favourite stealth game is back in a proper action game instead of a turn-based card game. 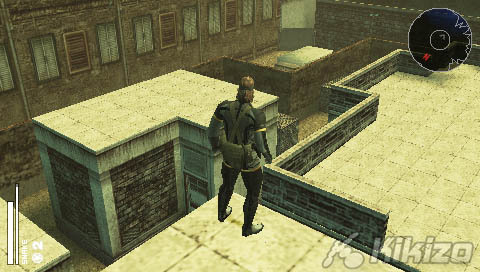 Other than the stylised interludes though, it's not the best looking game on the PSP. 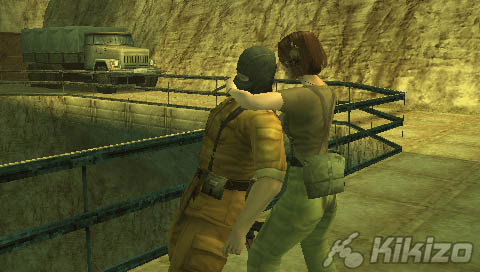 It's not even the best stealth-action game on the PSP - that accolade arguably goes to Syphon Filter Dark Mirror. A by-the-numbers game with a limited colour-by-numbers look. 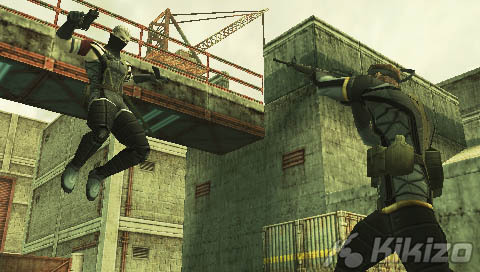 Whilst it won't win any accolades, MGS fans won't be disappointed.